In addition to Steven Moffat's guide, Doctor Who executive producer Brian Minchin gave a guide to series 9 in British magazine TV & Satellite Week. "The cliffhanger from episode one feels so important to get out of, so I can't say much about this. We're going to see the Doctor trapped and alone, facing his greatest enemy and a terrible temptation. We see more of a Dalek city than ever before, and we're going to surprise you with this episode." "Ghosts on an underwater base! Add in time travel and we realised that in Doctor Who you could be haunted by your own ghost. A hugely exciting episode with some of our scariest moments yet. And you won't see the cliffhanger coming." "Set a few hundred years before episode three... The Doctor needs to unpick the past to solve the future." "We couldn't believe the Doctor hadn't properly met Vikings before. They find themselves in a small, fighty Nordic village, with the Doctor doing all he can to persuade them not to fight the alien warriors that are menacing them. It doesn't quite work out as he planned." "A beautiful episode centred on the Doctor and Maisie Williams' character. There's a Highwayman menacing London, an alien lurking in the woods, and comedian Rufus Hound stealing every scene." "Some rogue Zygons are trying to destabilise the peace and start a war between Zygons and humans. We've gone global on this with stories split across the world." 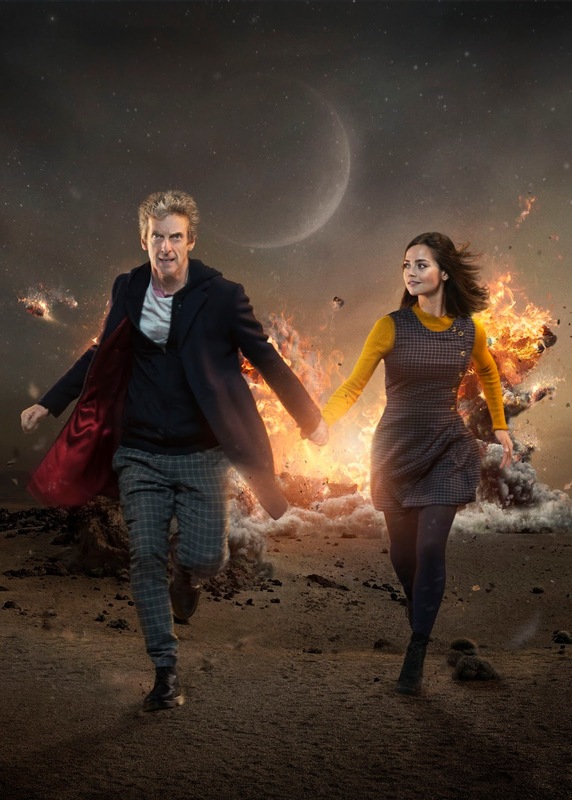 "The UK has been taken over by shape-shifting Zygons, Clara is in a whole world of trouble... It's a bit of an Invasion of the Bodysnatchers..."
"This episode is assembled from footage found in the wreckage of a crashed space station. We're just putting it out as it was discovered." "Sarah [Dollard, writer] had an idea about all those little side streets that don't actually exist, but what if they do, and what it actually inside them? Rigsy [from Flatline] is back, and he's in trouble. He woke up with a tattoo on his neck and it's counting down. No-one knows what happens with it hits zero..."
"This is a 'single-hander' which only features the Doctor and no-one else. It's the first time we've ever done an episode like it. And it's the most virtuoso, fantastic piece of writing from Steven [Moffat, lead writer]." "We go to somewhere I've always wanted to take Doctor Who, and meet the most brilliant new characters. There are monsters, battles, and surprises..."